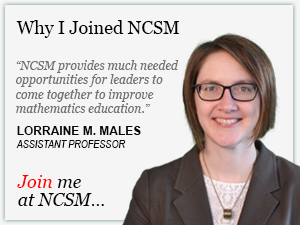 Thank you for your interest in NCSM eNews. 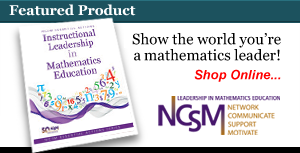 This brief and informative electronic communiqué is intended for aspiring, new, and experienced leaders in mathematics education - administrators, authors, consultants, curriculum leaders, department chairs, state or provincial directors mathematics coaches/mentors, mathematics specialists/coordinators, mathematics supervisors, principals, professional development providers, teacher educators, and teacher leaders - anyone who influences mathematics education. Sign up online for eNews. eNews is an automatic benefit to NCSM members and complements the other publications they receive as members. However, you do not have to be an NCSM member to subscribe to eNews. When you subscribe to eNews you will receive a confirming email message. You may unsubscribe yourself at any time. Each issue or message you receive will include unsubscribing instructions.